Two preserved wings were recently found in amber, and their first owners are thought to be the enantiornithines, an ancient bird that became extinct at the end of the Cretaceous period, nearly when all the dinosaurs became extinct as well. The amber was found by a team of researchers in the northeastern Myanmar, the wings included bones feathers and skin, according to the detailed study published Tuesday in the journal Nature Communications. The plumage, the feather layering, patterning, coloring and arrangement of feathers, in birds today already existed in at least some of their predecessors over a hundred years ago, as reported by National Geographic. Previous information about the birds’ plumage from the Cretaceous period, stretched from 145 million to 66 million years ago, generally came from impressions left in some of the fossils recovered or feathers trapped in amber as well but with no skeletal clues of their species. 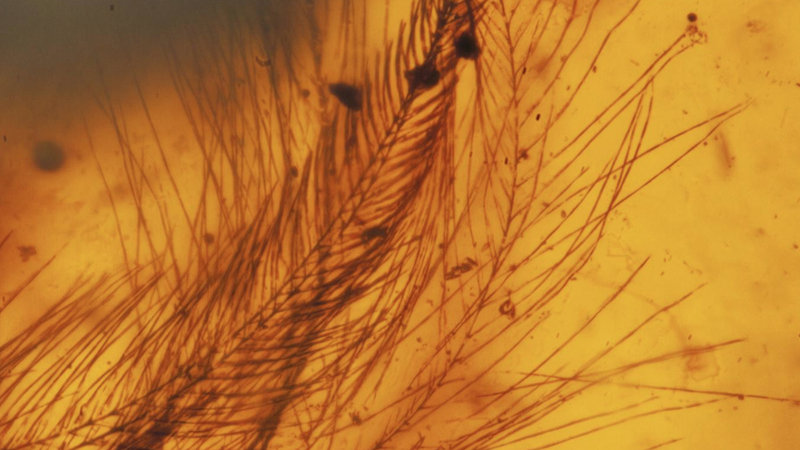 It is the first time that researchers observed feathers with skeletal materials, according to study co-author Ryan McKellar, who studies fossils in amber as curator of invertebrate paleontology at the Royal Saskatchewan Museum in Regina, Canada. During a more detailed analysis, researchers found that the amber even preserved claw marks, which were a sign that one of the birds had struggled against the sticky resin that had engulfed its wing, according to a press release from the journal. “The fact that the tiny birds were clambering about in the trees suggests that they had advanced development, meaning they were ready for action as soon as they hatched,” commented Dr. Xing Lida, the study’s lead author. X-ray analysis showed that the two samples belong to juveniles, based on the bone size and the advance development. The team determined as well that based on the plumage characteristics, the birds were of the same species. The colors of the feathers were several, and the flight feathers were mostly dark brown, but the covert ones ranged from a lighter brown to silver or white bands. “These birds did not hang about in the nest waiting to be fed, but set off looking for food, and sadly died perhaps because of their small size and lack of experience.” The isolated feathers in other amber samples show that adult bird might have avoided those sticky situation, or pulled themselves free, Lida told BBC News. The place where the amber was found has a story of its own, most of the Burmese amber comes from mines located in the Hukawng Valley in Kachin state, northern Myanmar. The location is currently being controlled by the Kachin Independence Army, an organization opposing the government for over 50 years. As a consequence of this conflict, the excavation of the mines are not regulated, and the majority of the valuable material is sold to Chinese clients looking for jewelry pieces and decorative carvings. However, those parts that contain “phenomenal biodiversity” are commonly sold cheaper because the buyers often see it as an imperfection. The fossils can even be partially cracked or wholly during the polishing process. 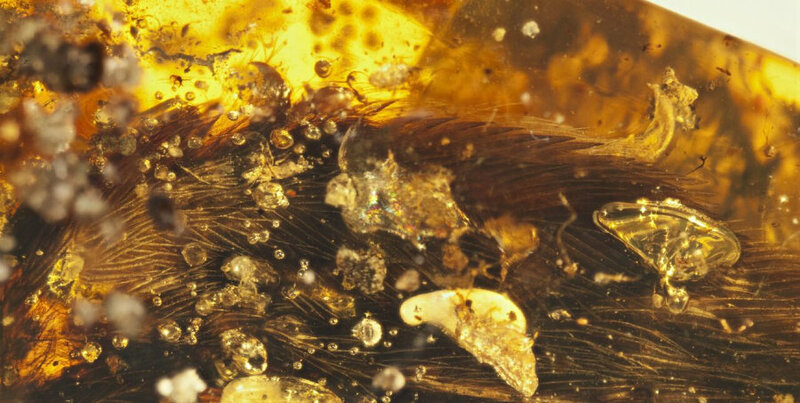 Researchers found in the old wings truncated surfaces directly on the amber, which suggested it had been chipped off of a larger amber inclusion. The more important piece could have included the entire early bird specimen, although this cannot be proven. In the future, is part of the team’s plan to establish an Institute in the mines where researchers can check amber coming from the working areas for Cretaceous inclusions, and protect those who may have relevant information inside. Recently, researchers involved in another study were also able to identify a flower fossil caught in a 30-million-year-old amber, which led to the discovery of an extinct plant species. Due to the plant did not match any known species, researchers named it Strychnos electri, from the Greek word for amber. The team found that the flowers were a member of a deadly family called Strychnos, the source of the poisons strychnine and curare. The extinct species also had toxic compounds like its possible successors, according to researchers. “It is pretty amazing that they have survived so long and they look so incredibly perfect,” said Lena Struwe, a member of the team that studied the fossils. “They look like something that fell off one of these lianas yesterday,” she added. The flower’s fossils were discovered among others 500 hundred had mostly insects inside. George Poinar, Oregon State University entomologist, and amber expert found out about the pieces during a field trip to an amber mine in the Dominican Republic back in 1986. Poinar first found more of his interest the insects at the time, and it was not until recently that he saw the extinct species, according to Phys.org.